HCM City (VNA) – The import-export procedures and specialised inspections have been reformed in a positive way, making it easier for foreign businesses, including those from Japan, to invest in Vietnam. This was the comment of Japanese firms at a food meeting held by the Japan External Trade Organisation (JETRO) in Ho Chi Minh City on March 20. 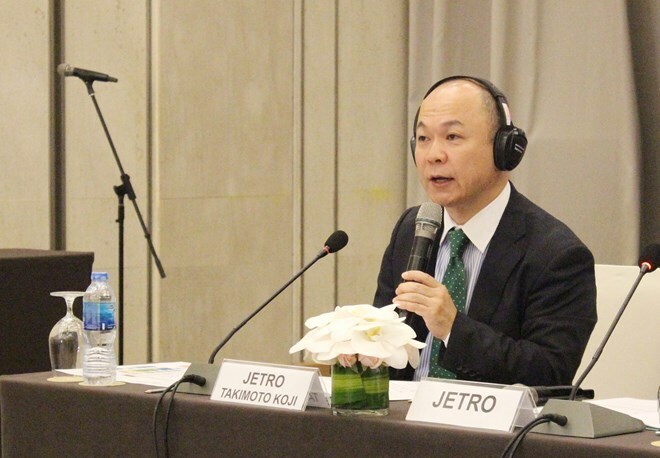 Nakagawa, lawyer at JETRO, said many difficult issues raised by Japanese enterprises at the annual event have been reviewed and addressed by Vietnamese ministries and relevant departments to offer more benefits for businesses. For example, businesses are now able to make their product announcement and take responsibility for their published information, thus saving time and cost. Takimoto Koji, chief representative of JETRO in HCM City, hailed the efforts of Vietnamese management agencies in administrative reforms and business environment improvement through listening to businesses’ opinions and removing their difficulties, as well as adjusting legal regulations in a more beneficial way for them. Participants also hoped Vietnamese ministries and departments to further improve the efficiency of policy enforcement and ensure equality for businesses while investing in Vietnam.